Number One Geek is creating a Geek channel for fun and education, including tutorials. And thank you for looking at my page! My name is Rich, also known as Saz and I am a creator, of a lot of things, from costuming, art and graphics and I have a LOAD of fun messing around with all the geeky stuff in the world. What is my Patronage for? It isn't for profit. It's to continue to be able to dedicate myself to helping others achieve a better education, improving themselves and even giving themselves a better option in life by learning the skills I have taught myself since I played with my home computer back in the 1980s. I intend to pass out my knowledge to people using my Number One Geek channel on Youtube and, of course give extra special stuff to you as a Patron, including being able to pick my brains. So, what do I get out of it? Well, firstly, you'll be able to help me improve my content by purchasing equipment for my endeavours. I also have a wealth of knowledge in a lot of non standard techniques, including, but not limited to: Fiberglassing, modelling and sculpture, 3D Modelling, programming, Graphic Design and I intend to do fun stuff as well, for those who are interested in the lighter side. All of this I am willing to share with you. Just some of the projects I have done. If you have all these talents, why aren't you using them practically? I have, in the past, helped many people with their creative needs, including supplying items for them to start as a base, but I was diagnosed with Clinical Depression, Anxiety and Agoraphobia in 2014, which has severely hampered my "get out and go" spirit. I used to be a professional wrestler back in the day, so I learned to roll with the punches. Heck! I could even teach you the basics of Wrestling! Why don't you join me, as I play games, review things, board game, RPG, paint, make, create and generally have an awesome time celebrating everything about geekery and the like? Your patronage can help me improve my content AND give you a say in how that content will be produced! Thanks again for reading and I hope this is the start of a beautiful and very geek-like relationship! Your run of the mill basic support that will help me continue to run my Number One Geek Channel. You get a hearty thank you from me and regular polls asking you what you think of the show and where I should go next. Each payment will give you access to the NumberOneGeek Minecraft server and help grow the gaming community based around that game. Access to the NumberOneGeek Minecraft Server. For those who want to help with the cost of buying in stuff to review and demonstrate, as a reward for your extra help in this you'll get improved Discord access, meaning you'll be able to ask me direct questions and get involved with a lot of the behind the scenes stuff. Patreon Plus access, giving you more freedom. Members will get access to all NumberOneGeek Private Game Servers. For your serious help, I am prepared to give you direct access and the ability to help me make my content, including allowing you to be a part of my shows, including multiplaying games, suggestions for shows and being directly named as contributor on my channel. I can even spend time talking to you as part of my discussional sections. Your input is listened to first. Ability to make suggestions for shows. Opportunities to be in the content as a contributor. This if for people who want to get serious! You will get unique access to my shop and tutorials I will produce regarding Molding, casting and fiberglassing. I will also do some live casts where you can ask questions and I'll do my best to answer them. Direct access to my fiberglassing knowledge. Help me run my projects for 12 consecutive months on this tier and you will receive a helmet of your choice. I will contact you with your choices (mostly Mandalorian) and I will send you the helmet. Receive a cast helmet of your choice after 12 months cconsecutive recorded patronage. 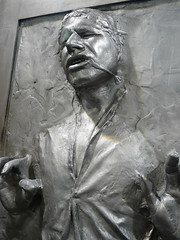 Follow me as I go through the process of casting my Han Solo in Carbonite model. Potential live streams with access to my friendly network of experts who are helping me work on the project. Keep supporting me for a whole year and you will get a cast of the finished result once you have logged 12 consecutive months of payments. You would have to pay for delivery. Get exclusive access to my HIC project. Get a copy of the HIC after 12 consecutive months of support. Plus all previous rewards (except the helmet). When I reach $100 per month, I'll do a poll for the Patreons to decide my next series of stuff, from a selection.